A review of the technology status is given here, arranged by components. A colour code has been used to show the popularity of various technical options for all cases that have been analysed and for which there was information available. The colour code shows the estimated frequency of occurrence of each option, as a percentage (see Table 6.3). This analysis has been made for each of the SWT power ranges defined in Table 6.1. The results for the analyses of the generator and the power electronics used in SWTs are summarised in Table 6.5. Brief comments have been included for the different sizes of SWT. Another aspect in which SWTs are different to large grid-connected wind turbines is the generation efficiency. Firstly, the efficiency for SWTs is not well known, as there is not much information available; second, the values are usually significantly lower than those for large wind turbines. Aerodynamics has something to do with this, but principally, designs for SWTs are not optimised. 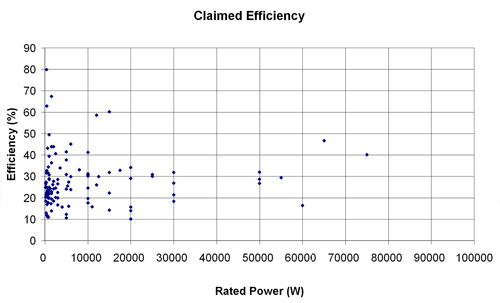 Figure 6.1 shows a graph of manufacturers’ claimed efficiencies for SWT as a function of rated power at rated wind speed. It should be noted that IEC standards for power curve measurement are not as rigorously applied by SWT manufacturers as they are in the large wind turbine field, and so comparison is difficult (see Appendix E for further details). In reality, the actual efficiencies tend to be even lower (values between 10 and 25 per cent are common). 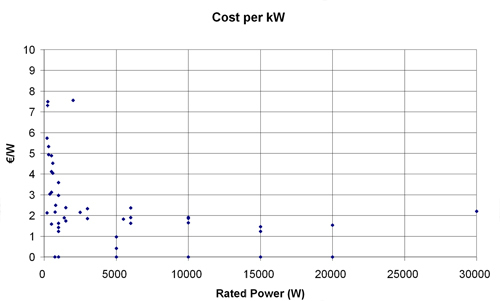 It is common to use the cost per kilowatt for the analysis cost of different generating technologies. For the case of SWTs, the picture obtained is as in Figure 6.2. Values are greatly scattered for the low power range, but the trend is that cost per kW diminishes as the rated power increases. However, an overall cost analysis for SWTs must be preceded by a comment on the definition of the rated power of an SWT. In wind energy generation, there are no universally-accepted standard test conditions (STC is the term used for photovoltaic generation) to which all of the characterisations of the devices are referred. So, it is the manufacturer who chooses the conditions (rated wind speed) for which to define the rated power of the SWT. 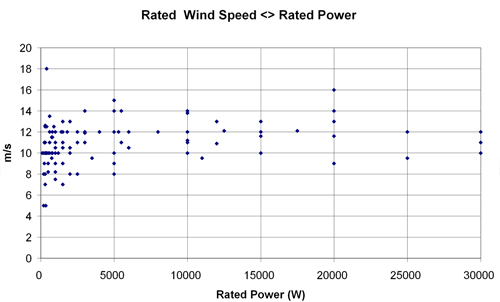 The situation is clarified to some extent in the Figure 6.3, where the chosen rated wind speeds are shown for the different rated power values of the SWT under study. The large variation in the rated wind speed value means that the specific parameters related to rated power cannot be compared directly, as they do not refer to the same conditions. For large wind turbines there are no defined standard conditions either, but the higher maturity of the market has led to a much lower dispersion. Another parameter, which is objective, and not subjective like rated power, is the swept rotor area. 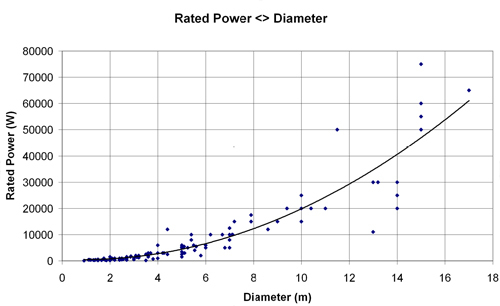 Figure 6.4 shows the variation of power rating as a function of the diameter. Even though for higher diameters some dispersion appears, the swept rotor area seems to be a better representation of the power of the SWT than the rated power itself, and it is definitively more representative of the total energy generated by the SWT. That is also the reason for using the cost per square metre, as shown in Figure 6.5, for the cost analysis. 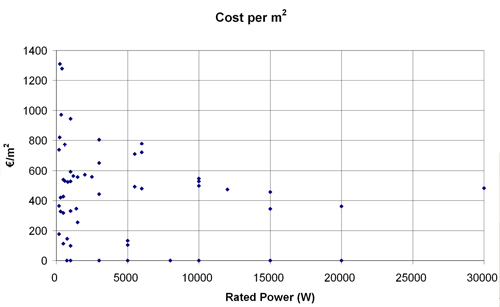 Even though there is still a significant scattering in the low power range, which is a sign of lack of maturity of the market, the trend of lower costs per square metre is maintained as the size of the SWT increases, which is an advantage when compared with PV generation, a direct competitor of SWTs.